New Rochelle Albert Leonard middle school students are digging soil, in a literal kind of way. 6th graders explored in We Future Cycle classroom sessions the connections between throwing food waste in the garbage and climate change. Learning about methane and leachate got their attention. Just thinking past the garbage can is eye opening for these students. While New Rochelle’s entire student population is now sorting their lunch waste between Commingled Recycling, Food Waste and Trash, thus reducing trash by a whopping 97%, they have not quite learned what actually happens to the food waste. In classroom presentations, student were walked through the chemical process of decomposition, they chuckled a bit when asked if the banana looks the same when it comes back out and they quickly got the concept of nutrients, water and energy being the basis for life. Making connections between how the apple tree takes nutrients out of the ground to grow the apple, which in turn nourishes our body when we eat it, and how the left over still contains many nutrients that could benefit the soil if put back, but creates havoc if treated as garbage and dumped in a landfill, was a completely new line of thought to all students. Students had the chance to dig through soil samples, seeing and touching the difference organic matter made in soil samples. They were tasked to make determination in terms of water retention capabilities, nutrient content and how plants might like to grow in that particular soil. Social Studies questions were introduced for students to think about how a the quality of soil might affect the wealth of a country. What started out with students looking somewhat puzzled at three soil samples on their desk, ended in some fabulous essays about why composting is so important to the survival of our world. Great job Albert Leonard students. New Rochelle Middle School Students Dig Healthy Soil, literally! We Future Cycle recently taught a workshop about food composting to all 6th graders at the Isaac E. Young Middle School. Before We Future Cycle set up the recycling program in all of New Rochelle schools, students were taught in the lunchroom to “just throw all their garbage out”. And the result were heaps of bulging and dripping bags of garbage every day. Since the implementation, students are sorting their waste into excess liquid, recycling, and composting streams and from the 273 lbs of daily material, only 6.5 lbs are actual trash, whereas 126.5 lbs are food waste and trays that are sent to a commercial composting site in Ulster County. Students learned what actually happens to their food waste. They learned about the detrimental effect of rotting food in landfills and how it creates methane, a highly toxic, flammable and explosive gas into our air as well as toxic leachate into our ground water. Students giggled when walked through the decomposition of a banana through their own system, but understood suddenly how it all works. Understanding that the apple tree can only make an apple by using nutrients and water from the ground, these nutrients go into our body when we eat the apple and any left over should go back to the soil, rather than being treated as trash to create methane in the landfill. Students learned about the magic of taking two things we consider waste ( leaves and food waste) and by combining them and letting nature do its thing, we get black, nutrient rich soil. As activity, students touched, smelled and observed different soil samples and made determinations as to how plants might like to live in that soil. In the beginning, some kids leaned far away from the samples put in front of them, but warmed quickly to smelling and touching them, all to say : “oh, it just smells like dirt”. Easy to do, all we have to do is sort out our food waste and mix it with woodchips and leaves and after 60 days we have healthy soil. Easy! Principal Nieves and Assistant Principal Bruno are proudly displaying their Westchester County Earth Day Award. They are standing under one of the reasons they were chosen for this award. The “Jefferson Feeds the Garden” Tree is a beautiful display of paper leaves on a display tree. Each leaf signifies that a child brought a completely waste free snack to school, using reusable containers only and eating healthy. The healthy food waste from snack, like the banana peel or apple core went to the composter right next to the lovely raised bed garden. Under the guidance of Assistant Principal LeAnn Bruno, Jefferson implemented the We Future Cycle Lunchroom Recycling program and reduced its waste by 97%, students learned about class room waste sorting and building waste went down by 50%. Students learned about waste free snacks and healthy food waste started to be composted. Students also learned about litter and it detrimental effects on our Earth and Wildlife and we celebrated it all with a Green Writing Contest. 15 proud winners were loudly cheered by their class mates as they made their way up to the stage to receive their prizes and certificates. I am breathless just recounting all the environmental programs that We Future Cycle was able to bring to the school thanks to the unwavering support of both Principal and Assistant Principal. This award is well deserved. Congratulations! Paul Feiner, long time Supervisor for the town of Greenburgh is an ardent supporter of green and sustainable practices. We Future Cycle is partnering with the Town of Greenburgh to operate the first food composting site in Westchester. Currently the County of Westchester is spending close to a million dollars per week to burn its 2500 daily tons of garbage into the environment at the Peekskill incinerator. A look at the garbage composition reveals that nearly 50% of that is organic matter such as food waste. 33% are paper products that could be recycled and another 16% are plastics, glass, metals and cartons that could also be recycled and generate income for the County, rather than being burnt into our air at great expense. Only 4% of our daily garbage is actual trash. The weak link so far is what to do with the organic waste. Yard waste is already collected and most Westchester communities truck it out to a commercial yard waste composting facility in Rockland or Putnam County. At great expense I might add. Greenburgh alone spends $ 1.25 million disposal fees just for leaf season. And that does not account for the actual trucking expenses, only the disposal cost. So,what to do with the food waste? 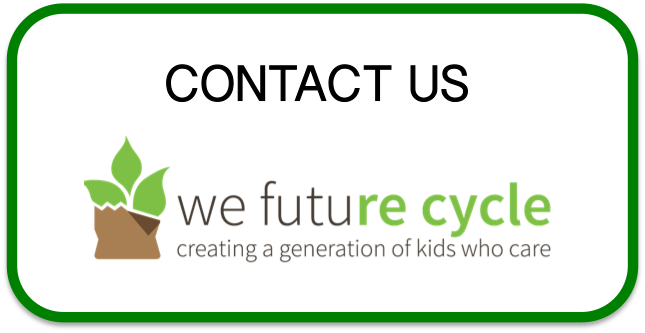 We Future Cycle has brought their ground breaking recycling program now to many schools in the county, redirecting 95 to 97% of the lunchroom materials into recycling or composting streams and away from trash. So far, the food waste is going to the Ulster County Composting Facility, quite a trek up I-87. They mix 3 parts leaves / wood chips with one part food waste and -voila- 3 months later, they have a salable product called potting soil that sells for $6 per cubic foot at Home Depot. And why bring a valuable ingredient for healthy soil to be used somewhere else? So, the Town of Greenburgh is stepping up to the plate to bring the first food composting site to Westchester County, keeping valuable resources within the county, reducing trucking and disposal expenses, lowering costs so that more schools can participate in the program and generating black gold. A total win-win situation. We Future Cycle is proud to be part of this. Check out that pile of sorted out trays! Today was the big roll out day of the We Future Cycle Recycling Program in the 4th Elementary School of White Plains. The waste audit yesterday revealed that GW with its 650 students generated normally 16 bags of trash, weighing 235 lbs. All students went through class by class presentation by experienced WFC staff that skillfully walked the children through the realization that just because a food packaging is empty, it does not mean it is garbage and thus useless. Students learned that most of their everyday lunchroom packaging is fully recyclable if just sorted out, and they also learned that by sorting out the food waste, we could create compost, a valuable resource. Looking at pictures of the piles of garbage from their school, generated from lunch and night clean, and then learning that there is no “away” for garbage was eye opening even for the littlest one. When asked if they were ready to save the world by sorting their waste into the right bin, they were READY! And they showed it in the lunchroom! Under wonderful guidance of the entire TA staff, and great personal engagement by the head custodian, the students, from K through 5 pulled off a wonderful job and reducing their garbage by a whopping 98% by sorting the materials into Food Waste for composting, Commingled for Recycling, Excess Liquid to go down the drain, and untouched food to be donated. From 291 lbs only 6.5 lbs were actually trash, one small fluffy bag, instead of the 16 heavy dripping and bulging bags from yesterday. That is truly something to write home about. All of GW students can be proud that they are making a real difference every day now. “We had no trash at all today” proudly says Sebastian , a pre K student, and then hugs my leg. And then he gets to paste a Waste Free Leaf on the fabulous tree outside the Principal’s office. In June I sat surrounded by 3 and 4 year olds. One girl even sitting on my lap. In front of me is a tray with all their waste from snack. Asking little ones like that where the trash goes, they will give you answers like “in the garbage can”, “in the garbage truck”, but when you ask deeper where they thought the garbage truck goes, they all stopped to think. I watched them figure out that -of course- the truck has to go somewhere and then guided them through the process of understanding that Westchester’s trash gets burned into our air. Together we resolved that it is just as easy to put the sandwich in a washable container than in a single serve plastic baggie. And they got it, amazingly quickly. Introducing the We Future Cycle Waste Free Snack program that combines education of children and ultimately also their parents with a fun hands-on activity has brought great change to schools. At the German International School White Plains, the entire elementary school is participating. We Future Cycle went to each classroom. We talked about how to package foods in a more responsible way, how to be waste free, how to be healthy to our body and to our Earth and we introduced on-site composting. To make decomposition touchable for the students, two composters are placed at a convenient spot and each class learned about it. Each time the students are waste free and have only compostable waste, they are rewarded with a leaf to paste on the beautiful Waste-Free-Tree and two students get to feed the composter. It is a very coveted job and as they dump the fresh banana peel in, they get to check out what happened to yesterdays apple core, bringing natures circle of life close to home. Needless to say, teachers are reporting that a record numbers of apples and bananas are coming in since the beginning of the program. But what is the most satisfying for me, is that the students are suddenly aware of how their actions make a difference, they are aware that waste is a problem, and they join me celebrating being waste free.